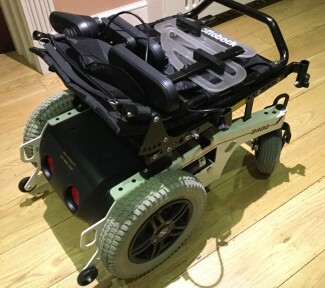 This is a barely used Otto Bock B400 power wheelchair. These wheelchairs have a very good reputation for build quality. It was bought to fit in the boot of our car using a wheelchair hoist and has 2 lifting points to facilitate this. It folds right down to a cube shape to make it easier to hoist. 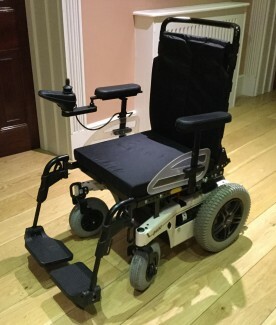 It has great manoeuvrability through narrow areas and the compact width measurement of 58 cm is one of the reasons why this wheelchair has become popular. It has a low seat height of 43 cm to allow the user to be able to sit at a desk or table. It was used by a man who was 6’4” so the low height was not a problem. Seating width is 38-48 cm. Floor to seat height without cushion is 43 cm. Overall length is 90 cm. Maximum user weight is 140 kg/22 Stone. Speed 4 mph.